By definition, a mural is a very large image, such as a painting or enlarged photograph, applied directly to a wall or ceiling. In the case of mosaic murals, it is not a painting or a photograph that will be decorating your wall, but a work of mosaic, made from glass or other material. You have definitely seen a mosaic mural in your life, whether in a hotel, a restaurant, a bathroom, or a museum. A mosaic mural is always a good idea to bring your space to life and give it a nice elegant touch. 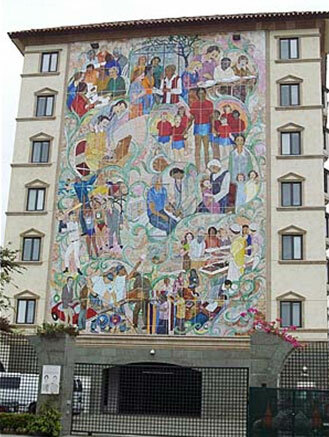 One of the largest glass mosaic murals of its kind in the world is the one hanging on the Villa Harvey Mandel building, in San Diego, California. It measures 43 feet wide and 72 feet tall and is among the last works of artist and designer Mr. Italo Botti, who died four months before its completion.